This is a historic listing of vehicles owned and operated by Duncan's - Grawin. Bruce and Kerry Duncan commenced in 2001 with Line of Route N1071 Lightning Ridge - Grawin ex JA Healey, Grawin with MO 2912. Acquired Line of Route N0892 Walgett - Cumborah from JS Aubrey, Cumborah with MO 4072. Acquired Lines of Route N1075 Walgett - Gingie Village & N1081 Walgett - Namoi Village from Chris Perrin Pty Ltd with MO 7296 & MO 8068. 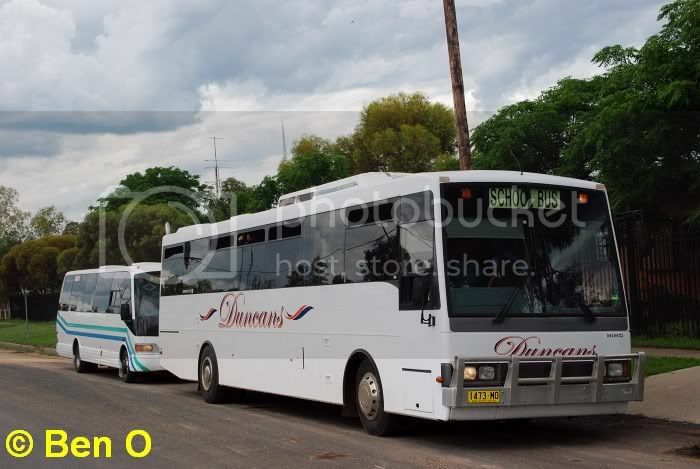 Sold contracts and buses to NRC Buses Pty Ltd 1/9/15.